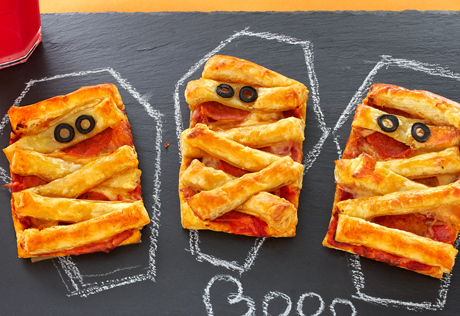 Arrange 6 pastry strips on each pastry, placing them slightly askew over the filling to resemble a mummy's bandages. Brush with the egg mixture. Place 2 olive slices on each pastry for the eyes. Flavor Variation: For a twist on ham and cheese, omit the sauce, mozzarella cheese and pepperoni. Layer 1 slice deli ham, 2 slices salami and 1 slice deli Cheddar cheese on each pastry rectangle, folding the edges as needed to fit on the pastry without hanging over the sides. Arrange the pastry strips over the filling and proceed as directed above.